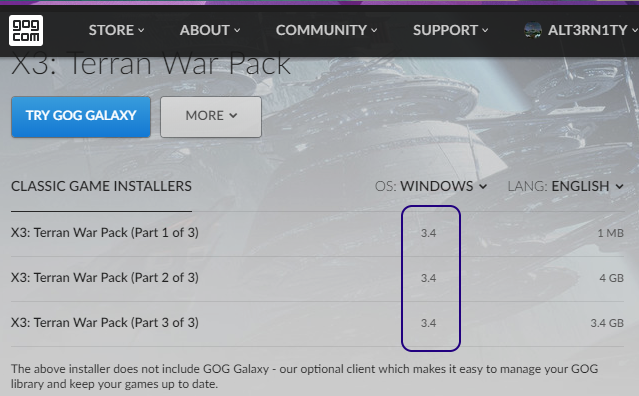 Thanks for making great updates to such an old game and for pushing them to GOG too. I actually was using window mode 1440p so those changes are welcome (I had to use a tool like Borderless Gaming before to avoid the taskbar issue, great to have native support instead). Performance updates to my fave game x3tc? that hopefully can propagate to Litcube's and Mayhem mods? EgoSoft, you see that big gravity wave approaching on all sensors? Put your ear plugs in, because that's the big cosmic HUZZAH! coming your way. myrmidon wrote: Performance updates to my fave game x3tc? that hopefully can propagate to Litcube's and Mayhem mods? They were general engine optimisations, so they should do. myrmidon wrote: EgoSoft, you see that big gravity wave approaching on all sensors? CBJ wrote: The performance improvements will depend on the situation. They are not huge, but they should be at their most noticeable in situations where the are a lot of bullets flying around. If your game was previously limited by GPU constraints rather than CPU then you probably won't see any difference at all. Are these improvements in the .exe or .obj files? "Bullets In Progress" is the largest performance impact in LU right now. If this has been fixed in the .exe, LU will get a large weapons update. The change is in the EXE, not the story files. And yes, instances where there are a large amount of bullets is one of the cases which will be improved. Of course large battles are still going to be heavy on performance, but hopefully you'll see enough of a gain to make the changes you want. Great news, thank you for the patch! The idea that Litcube's Universe will be even better thanks to this update is great. Well, the biggest resolution I see is 2560x1024. In the fullscreen listing the correct resolution (x1440) is showed but not in the borderless or windowed. The same bug is with AP too. I'm on Windows 10 / GTX 980TI & latest nvidia drivers. Are you sure you've updated your games correctly? The fullscreen resolution would have been available before the update, so that's not an indication. CBJ wrote: Are you sure you've updated your games correctly? The fullscreen resolution would have been available before the update, so that's not an indication. I have the GOG version (with Galaxy Client) so the game was automatically updated. I also run the "verify/repair game" and it did not make any difference. I'm now seeing the same problem and I'm now trying to find out why the change didn't appear in the released version. CBJ wrote: I'm now seeing the same problem and I'm now trying to find out why the change didn't appear in the released version. Thank you for your fast replies! Let's hope the bug is easy to solve.